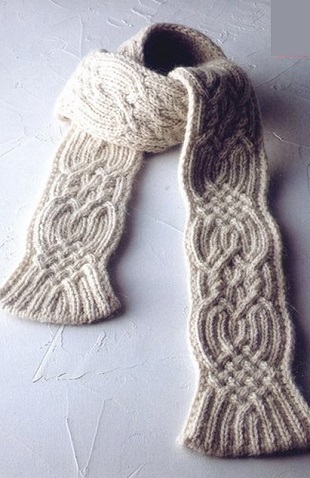 Beautiful knitting pattern for a warm cabled scarf. Is it possible to get a text version of this pattern? I put up everything I have about the pattern so for this one it’s just the diagrams. Thanks a lot! I love the pattern. It us beautiful pattern. I’d love to mKe it, but I am not surd what the sy bols mean. Thd horizontal and vertiv a ls Re obviously knit and purls – which are wnich. . . And what are the “V”s? A real shame there are no written instructions. This is lovely and I’d make it, but charts and I do not get along. Hey guys ! I like that scarf pattern so much that I showed it to my boyfriend and BAM ! “I want you to knit me that scarf, pleeeease “. Ok, no problemo, except that I didn’t have the slightest idea about how to do it (I Don’t read Japanese sadly). So I spent a few hours trying to knit what’s on the charts, trying to understand how this all works. Let’s beging by understanding that pattern, it really helps knitting it. The pattern starts by knitting 2/2 rib stitch. As you know, rib stitch will kind of contract itself and you will only see the knit stitches on each side : that gives you virtually to sides of stockinette stich like the two sides of a slate. So if you knit a cable between 2 ribs of knit stitches and leave the rib of purl stitches between them at the exact same place (in the middle, and in the background – very important), your cable will appear only on one side and the other side will stay classic 2/2 rib stitch. 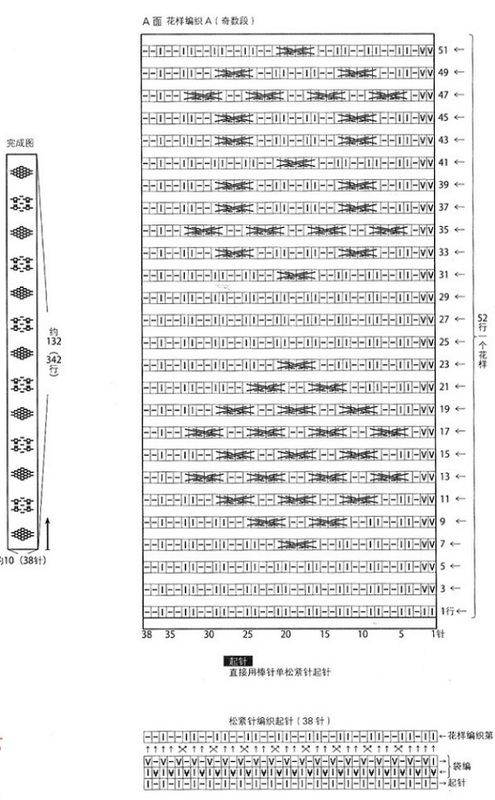 That’s very clever and gives you the opportunity to knit a reversible scarf, because each row is reapeated on each side (hence the two charts : one for even rows and one for uneven rows which are exactly identical). I suggest knitting a sample and a few cables (both left and right since they are knitted in a different way) and on both sides. V : as explained above, you slip purlwise the first 2 stitches of each row, they will be purled on the next row, and give you a nice stockinette border that kind of make a thick border which is very pretty in the reversible scarf. I dont’t know if I got that ok, but I slip 2 stitches purlwise, with yarn in the back, then bring yarn in front and purl the 3rd stitch. So know you have a right heading cable on the side you are knitting, and still regular 2/2 rib stitch on the other side. Your stitches in the cable are now : 2 1 4 3 6 5 with 4 3 being in the background and 6 5 being in the foreground. So know you have a left heading cable on the side you are knitting, and still regular 2/2 rib stitch on the other side. Your stitches in the cable are now : 2 1 4 3 6 5 with 4 3 being in the background and 2 1 being in the foreground. All you have to do is keep repeating the pattern until your scarf is the length you desired. I used Mongolia 5 yarn from Fonty with 6 mm needles (as indicated for this yarn) and it’s absolutely beautiful so far. The scarf is 12 cm large wich is rather good in my opinion, it shouldn’t be two wide cause the cables make it quite sitff. I was able to knit 2 repeats of the pattern in 4 days of holiday (but not knitting all day long) so this is way faster than I expected. Sorry for all the faults, I’m french and I’m trying my best. Don’t hesitate if you have any question. I found a Japanese chart on line with illustrations. What is the key for the scarf pattern, and what yarn weight and needle size was used to make it? I’m rather new to knitting, so I know this scarf might be a challenge for me, but I absolutely love the look of it so I’m willing to try it. Thanks!